I had a wonderful Jazz Night Out when I saw the “A NOW Shade of Blue” concert in the Huntington Recital Hall on the Capital University campus on Thursday, February 11th. This was the jazz representative in the schedule for Capital’s 30th annual NOW Music Festival, which celebrates contemporary music. After an introduction from festival founder and director Dr. Rocky J. Reuter, the evening began with a solo piece by faculty saxophonist Dr. Michael Cox entitled “Improvisation Matrix (2.11.16),” an improvisation using the EWI (Electronic Wind Instrument) and various pedals that resulted in an intriguing New Age-esque piece that could have fit well into a science fiction soundtrack. Next up was Spectrum, Capital’s faculty jazz ensemble, performing three pieces by faculty composer and guitarist Stan Smith. Opener “Pivot” was aptly titled, as dramatic rhythm changes sent the band careening from uptempo swing to free improvisation to slower solo passages. Medley “To Eleven/G/Out of an F Chord” contained several free-wheeling movements, building drama in the first two sections that boiled over in the third, with Smith’s hard riffing leading the charge and spurring on the powerful horn section. A smoldering solo from trombonist Ryan Hamilton and a bright passage from pianist Erik Augis followed, leading up to a breathlessly thrilling conclusion. 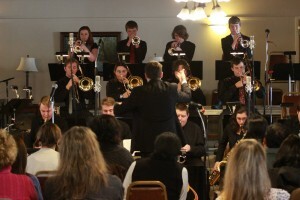 The second half of the concert was performed by the Capital University Big Band, under the direction of Dr. Lou Fischer. The overall program did a great job of mixing the sounds of traditional big band, funky ’70s-inspired compositions, and avant garde elements into an engaging whole. Fischer’s “Weather, You Needn’t” started with cacophony from some members of the band, then the director walked in and led those members not playing, and eventually the audience, in establishing a rhythm by clapping along. When the rhythm section suddenly joined in, a bolt of electricity surged through the auditorium and an undeniably funky groove was born. Described by Fischer as one of his greatest directing challenges, “Abstraltes Bild (Abstract Image)” by Fred Sturm was led by Matt Hakes’ sprightly soprano sax lines before the brass section took charge with a mighty burst, causing a full band explosion of lustrous sound. The late pianist and Capital faculty member Mark Flugge’s big band arrangement of his own tune “Drivin’ the Bus” was another highlight, with the different sections exchanging the spotlight over the relaxed swing rhythm and great solo work from trumpeter Rachel Spencer and pianist Julian Dittmer. The band also took on Sy Johnson and Dr. Reuter’s arrangement of Charles Mingus’ “Don’t Be Afraid, The Clown’s Afraid Too,” which debuted at the first NOW Festival, alternating between circus-inspired chaos and moments of sleek big band sound. After the poignant “Jessie (For Mom),” written by Fischer upon the death of his mother and highlighted by the skyscraping guitar of Harrison Belew, the band put a funky bookend on the proceedings with Gordon Goodwin’s “Life in the Bubble,” featuring a pulsing Rhodes lead from Dittmer, fiery blowing from trumpeter Steven Jacobs, and a big bang from drummer Kramer Sell. This was an adventurous performance by all involved, showing that innovative jazz is alive and supremely enjoyable. has returned to this cozy neighborhood bar. Collis tells me this weekly gig is no longer a jam session, but the band will occasionally invite a special guest and “will play a mix of classic and contemporary jazz, latin, standards, and crowd favorites.” I enjoyed seeing this group of local jazz veterans in action there last year, and I’m sure this new version will again be a comfortable place to catch great live jazz with no cover in a relaxed environment. Friday, February 19th (10pm – 2am): Dynamo with The Pleasant Tense and Osage at Brothers Drake. Nashville futuristic fusion outfit Dynamo, often compared to Snarky Puppy and locals Safety Squad, returns to Brothers Drake after a successful September show for a varied bill. A funky melting pot of influences, the nine core members of Dynamo joined up in 2012 and soon became a touring (and recording) force. They will be the perfect act to top off a night of exciting new music, with opening sets from local soulful quintet The Pleasant Tense and local funky jammers Osage, both counting jazz players in their ranks. Doors open at 9pm and the cover is $5. Sunday, February 21st (3pm – 5pm): Swing Sunday with the Columbus Youth Jazz Program at Clintonville Woman’s Club. This annual event brings together many of the best student musicians in Central Ohio, as it showcases the three separate ensembles operated by the Columbus Youth Jazz program. The afternoon will feature performances by the Columbus Youth Jazz Workshop (Matt James, director), the Columbus Youth Jazz Studio Ensemble (Ryan Hamilton, director), and the Columbus Youth Jazz Orchestra (Mark Donavan, director). Admission is $10 for adults and $5 for students, and snacks and beverages will be available for purchase. All proceeds from ticket sales will benefit the Columbus Youth Jazz Orchestra’s June 2016 performance in New York City at Dizzy’s Club Coca-Cola, so help get future local stars ready for the Big Apple!